I absolutely loved director Wes Anderson’s Fantastic Mr. Fox. The film is his first foray into stop-motion animation and it’s like he brought the genre to him rather than attempting to adapt to the genre. Trust me; if you’re a fan of his previous work like Rushmore, The Royal Tenenbaums, and The Life Aquatic with Steve Zissou, you’re going to love this movie. 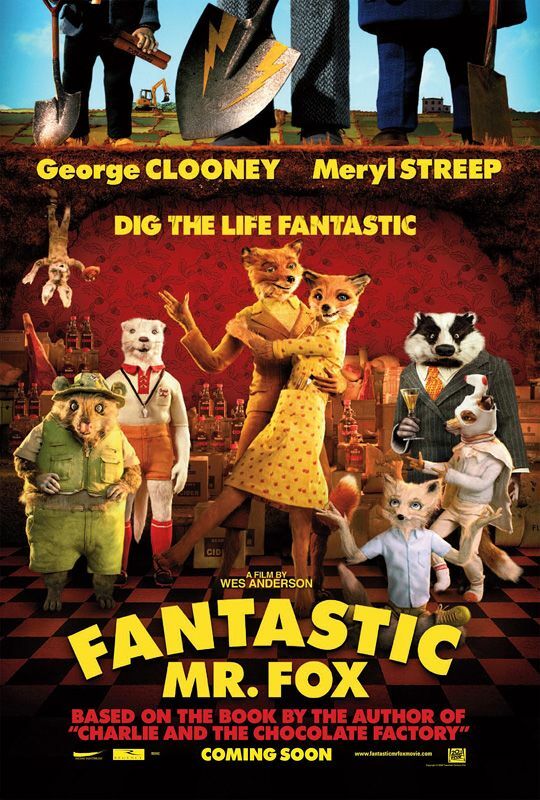 As most of you know, Fantastic Mr. Fox is based on the best-selling children’s book by Roald Dahl (Charlie and the Chocolate Factory, James and the Giant Peach) and it features the voices of George Clooney, Meryl Streep, Jason Schwartzman, Bill Murray, Wally Wolodarsky, Eric Anderson, Michael Gambon, Willem Dafoe, and Owen Wilson. But unlike some animated movies that cast famous actors to help sell tickets, everyone who provides a voice is perfect in this film. Again, this is a great movie that you should check out as soon as you can. Finally, Fantastic Mr. Fox opens this Friday in very limited release and it expands next weekend to more areas. And if you missed what Jason Schwartzman had to say about Edgar Wright’s Scott Pilgrim vs. the World, click here. Below the interview is the official synopsis. Mr. and Mrs. Fox (Clooney and Streep) live an idyllic home life with their son Ash (Schwartzman) and visiting young nephew Kristofferson (Eric Anderson). But after twelve years of quiet domesticity, the bucolic existence proves too much for Mr. Fox’s wild animal instincts. Soon he slips back into his old ways as a sneaky chicken thief and in doing so, endangers not only his beloved family, but the whole animal community. Trapped underground without enough food to go around, the animals band together to fight against the evil Farmers – Boggis, Bunce and Bean – who are determined to capture the audacious, fantastic Mr. Fox at any cost. In the end, he uses his natural instincts to save his family and friends.